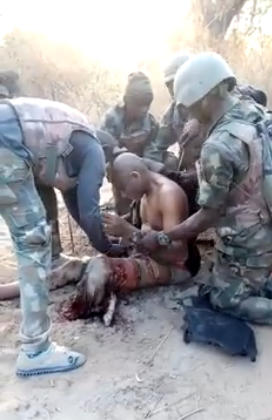 In a video shared on social media, a group of soldiers was seen filmed treating their colleague who lost one of his legs following an IED explosion while fighting Boko Haram insurgents on the frontline. The soldier was seen as very calm as his colleagues attended to him. Honestly, soldiers deserve the best!!! May we see the end of this evil soon..